This movie is very close to my heart, it means a lot to me, especially because it is a movie about Martial Arts, which makes it even more important for me. The movie is releasing in August this year, which also co-incides with me completing 25 years in the film industry and it means so much to me that this happens to be a movie about Martial Arts commemorating the accomplishment of my 25 years, when it’s because of my martial arts background that got me into the film industry in the first place. We’re mliterally going full circles. Could you please tell me more about the character you’re playing in “Brothers”? My character is a school teacher who teaches Physics and Chemistry. He used to be Mixed Martial Artist who would fight on the streets for money. Mixed Martial Arts is a very dangerous profession and due to issues monetary issues, my character faces he has no choice but to go back to the streets to flight in a professional tournament. How was your experience working with Karan Johar? Mixed Martial Arts sounds dangerous! Yes, Mixed Martial Arts is a dangerous practice that could result in injuries and loss of life. Even during filming we would end up with abdominal injuries and smacks on our face but overall it was important for the role to look realistic and conditioning for us actors to make the movie as real as possible. Desipte being a professional martial artists, I underwent vigorous training for six months to be fit for the role. But besides all the fighting, there’s also a poignant love story at the heart of the film which we find out later is the main reason why my character goes on to become a street MMA fighter. What all was involved in the training for the role? The main part of the training was a 6 month intense and gruelling work-out followed by practicing different fighting styles like Judo, Karate, Kyudo, Aikido and other Mixed Martial Arts. What was the most challenging part of your role? The most challenging part was fighting like a professional MMA fighter, learning from the best and then trying to catch up with their fighting techniques! But I thoroughly enjoyed it as my teachers are from everywhere around the world – from Brazil, LA, Bangkok and Japan – they are true MMA fighters. It was an honour to learn fromt the best. As part of our training programme I had to lose upto 16 Kg’s and Sidharth Malhotra had to gain 13 Kg’s in weight! Whilst fighting was a major physical challenge, we also had to face a lot of mental challenge. A very high level of mental attention is required to remember your punches and every move. Wow that must have been a challenge! Do you ever take a break? Hah, its been 25 years and I haven’t had a break J Jokes a part my international filming schedulre becomes a break for me. Its the best thing if your work is your passion in life. It makes me feel like I’m always on break. How was it working with Sidharth Malhotra? Sidharth is a very talented young man; he is very professional when it comes to work. Although he had no experience with MMA he did really well. He also went through 8 months of training. Sidharth has a great future ahead of him. In Brothers he plays the character of a “man” unlike his ealier movies, where he’s mostly played young characters. We had a great time on set. He’s a Punjabi, I am Punjabi and even our director Karan Malhotra is Punjabi! We spoke in Punjabi all the time to the degree the film should have been called Prah (Brothers in Punjabi). Haha. Do you have some MMA tips or warnings for your fans out there? Mixed Martial Arts is wonderful to watch, it is very parctical but dangerous at the same time. You have to be very careful when doing something like that. Watch and enjoy MMA, and if some people are thinking about doing it, they must be very careful and think about enrolling in training first, they must make a thoughtful decision before actually doing it. There are lots of talks going on about the movie everywhere, you must’ve done an amazing job. Infact I was researching about the movie right before this interview and I found out that the movie is a remake of the movie “Warrior” by Gavin ‘O Connor and Cliff Dorfman, I believe you will put forward an amzaing performance, maybe better than the original? Well that’s news to me but very humbling to hear. We have tried our level best to give the best performance we can. I wouldn’t really compare the two movies to be honest as we probably can’t make it better than the original but we gave it all we could. Let’s see what the audience says. The movie has a wonderful cast, we also have an “item-number” performance by Kareena Kapoor. Sidarth Malhotra and Jackie Shroff also play lead roles.. Is there a love story somewhere in the story line? Absolutely, there is a love story in the movie. I mean the movie is about street fighting, but there’s a reason to why the fighting happens in the first place which emenates from love. You will get to know that there’s a love story between Jacqueline Fernandez and I, there’s also a family related love story between Jackie Shroff and Sidharth and also between Shefali and I. The fighting comes later on in the movie, the film’s main emphasis is on it’s relationships. Akshay, what’s your favourite genre of movies? I mean you’ve done many different types of roles in different movies, which one is your favourite? Is it comedy, drama or action? I like comedy when its mixed with action, its just so much fun to do comedy with a bit of action, its fun to watch and also so much fun to do. So the movie is releasing on the 14th of August this year, which is just one day prior to the Indian independence day, does the movie have a hidden message of patriotism or any message relating independence of India? How has it been working with so many Karan’s in the movie? The director is Karan Malhotra and Karan Johar is producing the movie? Is there more Karan’s you’ll work with in the future? Ha, no that’s just a co-incidence, it was not planned to be like that. My focus is on the release of Brothers. After that I have Singh is Blinng coming out on the 2nd October and then Airlift in January 2016. In Singh is Blinng i play a larger than life character, something I haven’t done in a couple of years since Rowdy Rathore. My films have been pretty serious with Gabbar, Baby, Special 24. I’m really excited about Airlift as it is a story about Saddam Hussein’s attack on Kuwait. What is your hope for Brothers? I hope it brings in the mullah and gets the box office ringing whilst also gaining critical acclaim. Your final message to your fans please! I would just like to tell my fans how much it means to me to make a movie that they like. I really hope all my fans like Brothers. I would also like to tell them that the movie took about one whole year to make, we literally put our blood, sweat and tears into the making. The climax of the movie took about 52 days to shoot, just to get it perfect for the audience. All the fans across the globe should watch this movie on the big screen, watch it with your family and loved ones, do not watch pirated versions of it, we poured out our sweat and blood into this movie. Gary Fernandes (Jackie Shroff), a former alcoholic and street-fighter, returns home after serving a prison sentence of 10 long years to find that the wounds of the past still haunt his family. His two sons, David (Akshay Kumar) and Monty (Siddharth Malhotra), who had parted ways as kids, are grown men now, but are still bitterly estranged. Gary himself carries the burden of his guilt. His elder son, David is an ex-fighter turned school teacher. He and his wife Jenny work hard to make ends meet and to provide the best they can for their ailing daughter Poopoo. Troubled financial circumstances drive a desperate David to return to the world of street fighting. While, Monty struggles with his lonely complex existence. An alcoholic, he is active in the world of street fighting, but lacks focus and determination. He strongly yearns for the acceptance, love and respect of his family. As the story unfolds, we see the journey of these three men, as they seek to find redemption and healing. Meanwhile, the arrival of ‘Right to Fight’ is announced in India — the biggest international event in mixed martial arts history. Both brothers, at the crossroads of their lives, end up enlisting to fight in this ‘Winner-takes-all’ event. And it is here after an age of estrangement, unknown to the two siblings, they finally stand to face off with each other and against their personal demons, in the ultimate final battle. It is said, that when a deep injury is done to us, we can never recover until we forgive. With twists and turns, pouring emotions and edge-of-the-seat action, will this final battle between the two brothers repair old wounds? 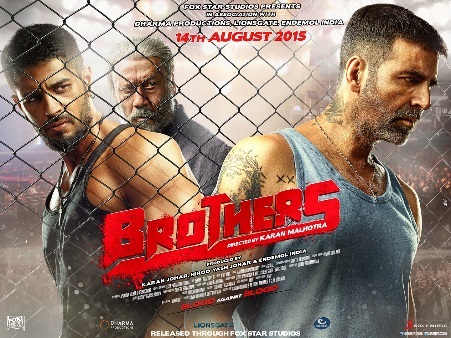 Brothers releases internationally on 14th August 2015 through Fox Star StudiosIndia.